Our mission is to reach out to others, proclaim God's word, share our faith and celebrate His love. My name is Shari Schwedhelm. My husband Alan and I married in August of 2013, and we live on an acreage outside Kennard. Together we have eight children ranging in age from 13 to 26. The three girls living at home are 13, 14, and 18. In January I also gained the title Grandma! Our busy family owns horses, gardens, rodeos, hunts, fishes, and lives the American dream, Nebraska style. I first sensed that I was called to be a leader in ministry while working as a camp counselor in 1990, but I have taken a long and winding path though several careers and a 25-year detour to bring me to this place in time, where I am at long last answering that call. 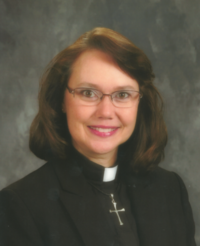 Prior to entering seminary, I owned and directed a child care center, worked in a variety of roles for Omaha Public Schools, and served as the Director of Faith Formation for Bethany Lutheran Church in Elkhorn, NE. I have spent the last 20 months serving as the intern and interim pastor for two rural congregations in Western Iowa. I completed my Master of Divinity degree at Luther Seminary in December of 2017. My faith has always been guided by a deep understanding that God is truly present with me in every situation. I believe that despite evil and darkness in the world, God works through each of us to bring about good. This confidence has been my comfort in times of trouble and my peace when the future is unclear. I am humbled and honored to walk with you through this season of transition. I hope and pray that our time together is joy-filled and transformational, and that we will form relationships that continue far into the future. Thank you so much for inviting me, and for the grace to continue growing in faith here.